This West Coast Ale yeast is used for a clean neutral profile that is able to attenuate the majority of fermentable sugars in your wort. BRY-97 also has no overwhelming characteristics meaning that it will help showcase the your aroma and flavour. 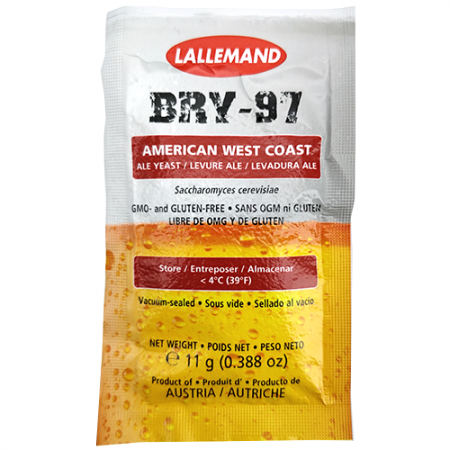 LalBrew® BRY-97 is an American West Coast-style ale yeast that was selected from the Siebel Institute. Culture Collection for its ability to produce high quality ales. LalBrew® BRY-97 is a neutral strain with a high flocculation ability that can be used to make a wide variety of American-style beers. Through expression of a beta-glucosidase enzyme, LalBrew® BRY-97 can promote hop biotransformation and accentuate hop flavor and aroma. Traditional ales made with LalBrew® BRY-97 include but are certainly not limited to Cream Ale, American Wheat, Scotch Ale, American Pale Ale, American Amber, American Brown, American IPA, American Stout, Russian Imperial Stout, Imperial IPA, Roggen/Rye, Old Ale and American Barleywine.